In their recent book, Chris Hann and Keith Hart show that anthropologists have contributed to understanding the three great questions of modern economic history: development, socialism, and one–world capitalism. In doing so, they connect economic anthropology to its roots in Western philosophy, social theory and world history. James Cuffe finds that it offers a thoughtful, well-planned overview of economic anthropology but due to its size and scope it cannot offer the definitive critique of the field. Economic Anthropology: History, Ethnography, Critique. Chris Hann and Keith Hart. Polity. February 2011. This review afforded me an enjoyable opportunity to delve into a favourite sub-discipline of mine. Economic Anthropology is written by two well known and respected anthropologists both very active in the field, Keith Hart (amongst other notable affiliations is the founder of Open Anthropology Cooperative – check it out!) and Chris Hann (Director of the Max Planck Institute for Social Anthropology). Both authors draw on their considerable ethnographic experience to offer a rich run-through of economic anthropology, and trace its intersection between the primary disciplines of economics and anthropology and against thematic currents such as Marxism and feminism. Considering the impact of the contemporary Western financial crisis on the world, now is the ideal time for us to re-engage with economic anthropology and understand the conceptions of economics that play out in the media and in the academy. This is in contrast to other modes of anthropology that refuse to make judgement (if that is possible) or seek to limit judgement and forgo statements in the presentation of research, or alternatively to advocate on behalf of those researched. The second point I highlight is their agenda: to establish, or at least prepare the ground for, a self-standing discipline of economic anthropology. A discipline that makes statements and offers critique and advice based on a cumulative tradition that they believe can offer answers to contemporary crises. In distinction to mainstream anthropology, an economic anthropologywould not run counter to the human sciences in the mode of ‘unmasking’ or ‘unmaking’ the products of other knowledge-producing bodies. Instead they argue for a disciplined branch of anthropology that can engage and be productive in parallel to the wider human sciences. These two points serve as bookends to the main content which is informative and thought provoking, covering a wide time-span and stirring a desire for further reading. This makes the section Notes on Further Reading a useful inclusion. Throughout the book they examine the changes in discourse and meaning of key terms such as economics and development. They source the root of understanding development as the migration of people to urban life and economic development as the term for investigating how to bring such migration about in an equitable manner that resists the detrimental effects of such change. The authors highlight the flexibility or even outright confusion of the term economics in contemporary usage. They trace its origin to budgetary management of large household estates in ancient Greece ‘oikonomia’ to modern division of labour from markets and subsequent dominance of markets by firms and their tricky relationships to national governments and national interest. Their treatment of historical developments in theory and practice are quick and concise covering a lot of ground. The summation of material and perspectives from the Ancient World to the Age of the Internet (the title of one chapter) allow the reader to see the development of current economic anthropology in a wide-angle view but if the reader seeks thorough detail on any particular aspect they should use this book as a guide only. 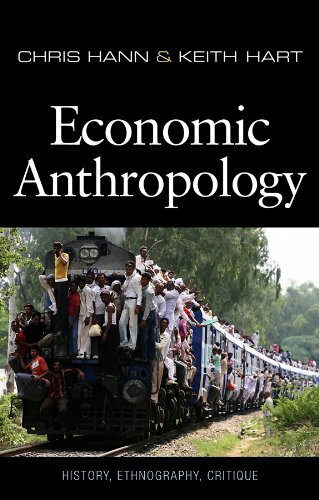 This book offers a thoughtful, well-planned overview of economic anthropology but due to its size and scope it cannot offer the definitive critique of the field nor can they develop their arguments as they might do elsewhere. The chapters or sections that directly draw upon their own fieldwork are enriched by it but left me wanting more. Of course more is available in their other works and this title is orientated as an introduction for those unfamiliar with the discipline rather than an in-depth critique. This title will make a valuable addition to undergraduate course text-books or as a sourcebook for modules on economic anthropology. As a textbook for novices to economic anthropology it should be digested with the help of either a lecturer or by referring to primary texts and here the notes for further reading towards the end of the book will be of great benefit. James Cuffe is an anthropologist working at the Department of Criminology at University College Cork. He is General Editor of the Irish Journal of Anthropology. Read more reviews by James.